Treasure Bingo Review | Get 120 FREE Bingo Tickets On Deposit! Yo ho ho and a bottle of rum, set sail with Treasure Bingo and discover if the pirate’s life is for you! Get ready to pillage all that you can out of this bingo site and find yourself with loads of booty. It’s not just a fun looking site though, they offer all new players a fantastic 120 free bingo tickets. So keep reading the rest of our review now to find out how you can claim! If you’re ready to set sail with this bingo site, then you can get started with no deposit required, as this website features plenty of free bingo games. That’s not all that you can claim either as they have a first deposit bonus ready for intrepid players too. Make a deposit of just £10, and you will instantly receive 120 free bingo tickets. This will have your account looking shipshape as soon as you get started! 60 free cards on your second deposit. 30 free bingo tickets on your third deposit. If you fancy a reload bonus of up to £75 then you should take part in the weekly ‘X-Marks The Spot’ promotion. Simply check out the treasure map, pick the spot you think has the biggest bounty, and you’ll uncover a code with a reload bonus of 50% – 75%. 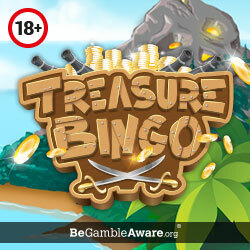 Treasure Bingo is available to play on your mobile device, though there’s no dedicated mobile app. Instead, you just visit the same site from your device and it will be catered to the size of the screen. No downloading or installation needed, just log in and get online faster than a speeding bullet. The pirate’s life is all about adventure, so you’ll find a load of adventurous bingo games on this site. Their lobby is like a galley of bingo games, with a constant schedule of bingo games around the clock. Whether you’re an early riser or stay up late to play, you’re never far from an excellent bingo game here. When it comes to the kind of bingo games that you can play here, there are too many to list! Penny bingo, sliding jackpot bingo, 90 ball, 75 ball, 5 line, progressive jackpot … the list just keeps going! This is the place to be if you love a variety of games and ways to win big. The prizes differ in each and every game, so you could be playing for a share of thousands or shouting bingo for loyalty points. These all have different ticket prices attached too, so there’s a price for any player on the site. Ready to go on a voyage to the slots section? Do so with Treasure Bingo and you’ll be amazed by what they have to offer. These games cover all sorts of themes and styles, so you could cast a spell with White Wizard or hop aboard the Sugar Train. They even have scratch cards and mini-games to keep players amused too, which are both added to on a regular basis. Recieve free tickets on your first 3 deposits. Claim a weekly promo code for bonus cash. Theme might not be for everyone. You can fund your account with Visa, MasterCard, Maestro, Neteller and Paysafecard. Withdrawals processed in 48 hours. Minimum withdrawal amount is just £5. Email the customer service team at support@supportbingoonline.com. Call customer services on 08082 387 546. Customer service team operates 24/7. If you’re searching for a site with a unique theme and top notch bonuses then Treasure Bingo should be your next port of call. This site does everything it can to ensure that each visit to their games lobby is fun and enjoyable. They have more jackpot games to discover than your average bingo site and they frequently have prize games too. It’s time to drop your anchor because you won’t want to leave this site anytime soon.